Bloomsbury USA Childrens, 9781681190129, 80pp. Read & Bloom offers high interest, character driven stories for newly independent readers that feature full-color illustrations throughout and will transition kids from leveled readers to a lifetime of reading. In this charming series, kids are treated to simple whodunit mysteries as an utterly delightful owl duo put their heads together. 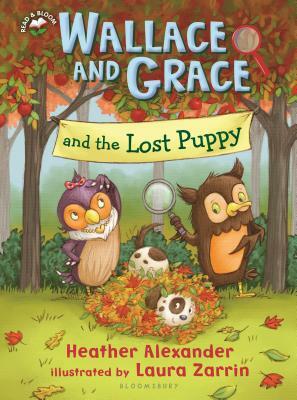 When Wallace and Grace are on a scavenger hunt, they stumble upon a puppy named Jasper who can't find his way home. Will the owl detectives be able to follow clues to get the lost puppy home? Laura Zarrin spent her childhood in the St. Louis area exploring creeks, woods, and attic closets, with plenty of tree climbing and digging for artifacts in the backyard all in preparation for her future career as an archeologist. She never became one because she realized she's much happier drawing. Laura lives in Silicon Valley in California with her very logical husband and teen sons, and their illogical dog, Cody.